I am assessing the similarity between documents represented as vectors of tf-idf values. 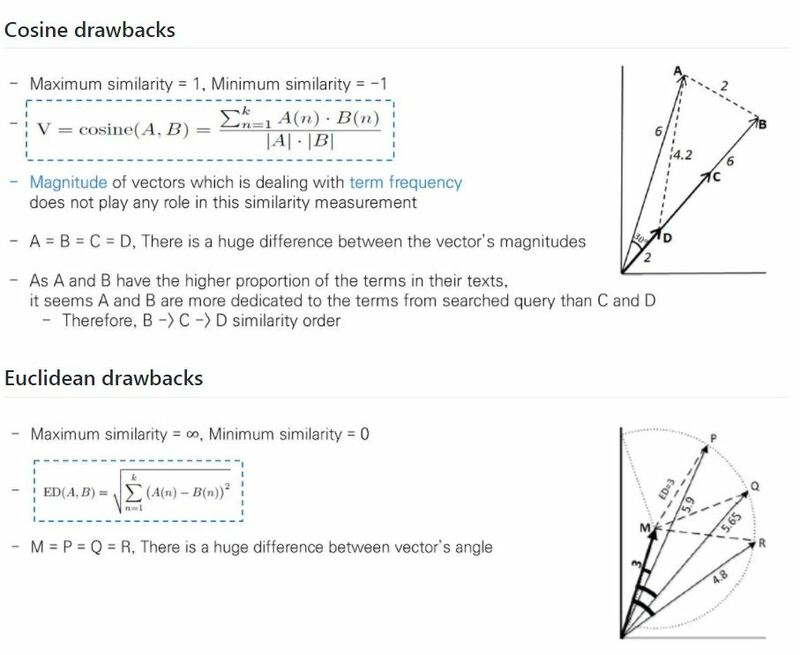 I know that the cosine similarity is a well-defined and commonly used measure in information retrieval. However I am thinking how to deal with the case where 2 documents are "linearly dependent". At first sight, $d_1$ and $d_2$ should be more similar than $d_1$ and $d_3$. How should we deal with this case? Reference paper is "A Hybrid Geometric Approach for Measuring Similarity Level Among Documents and Document Clustering"
If you want to see a summary of the paper, please refer to the github below. A short answer is that cosine similarity works best when there are a great many (and likely sparsely populated) features to choose from. Under these conditions, Euclidean methods tail off in terms of their sensitivity. Likewise, cosine similarity is less optimal under spaces of lower dimension. Not the answer you're looking for? Browse other questions tagged information-retrieval cosine-similarity or ask your own question.